This story will be in my forthcoming book, THE LONG WAY BACK. 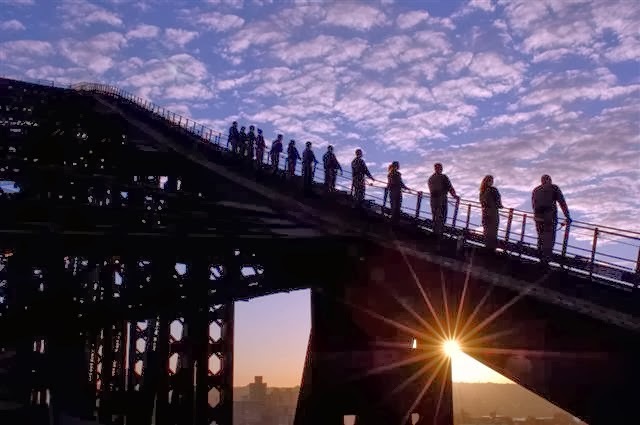 By now, I thought that we could understand much of the slang down under, but why Sydneysiders call their famous bridge “the old coat hanger” is beyond me. Considered ugly by some, it has always been a popular icon connecting the northern and southern shores. Construction of the Sydney Harbour Bridge started in 1923, by building two halves of the arch, supported by cranes, out from each shore. After nine years of work, the mating of the two arches was about to take place: the ends of the arches were only centimeters apart and ready to be bolted together. Unfortunately, a gale blew up and 100 km/hr. (62 mph) winds set them swaying. Dismayed but not defeated, the workers eventually managed to join the two parts. The bridge is the sixth longest spanning-arch bridge in the world and it is the tallest steel arch bridge. 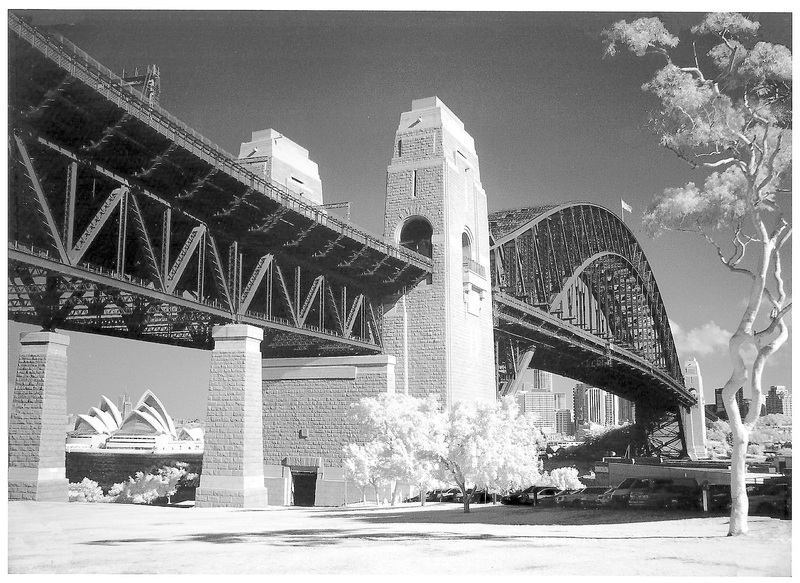 Sydney Harbour Bridge entrance from a print I purchased at the Bridge Climb. Peter, my travel agent, had proposed the bridge climb as the ideal urban adventure. “The Climb gets booked up fast,” he warned me, so he included tickets for two in our package. We know where to go to begin the climb: down by the Rocks. We saw the entrance marked Bridge Climb yesterday. While we wait in line at Admissions, I read the sign out loud: “The climb up and down is 1439 steps. Three hours total.” What the sign doesn’t tell us is that the entire first hour is spent preparing for the ascent: We sign safety disclaimers; we take a breath test to ensure that our blood-alcohol levels are beneath the legal limit; we change into grey bridge-suits and remove watches, hair clips, loose jewelry, and anything else that might fall onto the traffic, cycling and pedestrian lanes below; and finally, we don safety harnesses. Our group assembles in a training room where attendants provide us with pouches containing disposable rain jackets, scrunchies for ponytails, cords for glasses, and even handkerchiefs with elastic loops sewn in so that they can’t blow away. I’m impressed; they thought of everything! Finally, an attendant hands out radios and earpieces, and introduces our leader. We practice on a stairway. “Any questions?” our leader asks. Total silence. My fellow climbers look like astronauts preparing for a flight from which they may never return. The faces of some look white and peaked. The start of the climb is the worst. I glance behind me to catch Gunter gritting his teeth, his eyes steely behind his glasses. What must he be thinking about me right now? I try a tentative smile. He doesn’t return it. I focus on the climber in front of me. So far, so good. I glance down. Uff da! (as my mother would say). Only a metal grille prevents us from plunging to the bridge or the sea below! But I guess that’s what these harnesses are for. Problem is, every time we reach an abutment, we must unfasten the harness clip and afterwards, refasten it again. 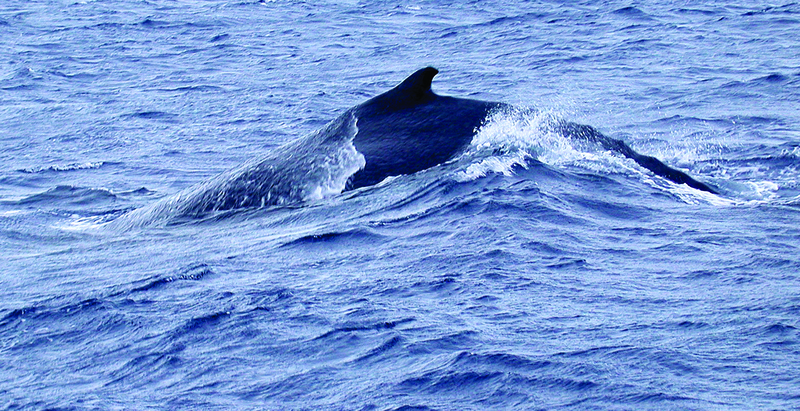 Like walking the deck of our sailboat. I glance at the white sails of ships luffing below, wishing I were down there instead. Well, at least the wind is light and fickle today—better for us than for them. We reach the arch, 134 meters (440 feet) above sea level. The bridge levels off and I exhale. Wow! I realize that during the climb, I was alternately panting and holding my breath. Gunter taps me on the shoulder. “Come closer,” he whispers. I notice that the climbers in front of me have stopped. Sydney Harbour sprawls below in all its glory, a dazzling panoply of coves, harbors and peninsulas. Ahead of us, skyscrapers reach toward the clouds. Behind, the familiar Rocks are back dropped by the Kings Cross intersection. I can see the Sydney Opera House now from an entirely different perspective. Glistening in the sun, the concrete roof structures remind me of rows of translucent sea shells skillfully positioned by a master artist so that they brush against each other, yet barely touch. Being here on top of Sydney is the highest high one can imagine. Awesome. Incredible. Magnificent. Stunning. Breathtaking… I run out of superlatives. If you go to Sydney, you must do the Bridge Climb! Bridge at night. Photo courtesy of Google images. Back on the pedestrian walk, we pick up our I CLIMBED IT certificates and photos and head directly for the nearest pub. “Time to get that blood-alcohol level up.” Gunter lifts his left eyebrow, a feat which never fails to make me laugh. There’ll be a good time on the old town tonight! One of my new year’s resolutions is to complete writing the text for the third book in my nautical trilogy, In Search of Adventure and Moments of Bliss: The Long Way Back. This sailing/travel odyssey covers the final third of our circumnavigation: Australia, Indonesia, Southeast Asia, the Indian Ocean, the Arabian peninsula, the Middle East, and on to Turkey and the other Mediterranean countries we sailed through until we “crossed the line” back in France where it all began. I spent most of yesterday writing just one of the many sidebars in the book: Did You Know? Australia. And I’m stuck. Australia is awesome! I fell in love with the land and the people. I could write an entire book on the year we spent there. But to give other countries a chance, I must be selective in the stories I tell. As for sidebars, each country in my books gets only one Did You Know of 750 words or so. HELP! Which part(s) of this list below do you think is either not important or not interesting? I appreciate your comments. Australia is about the size of the contiguous United States, but with less than ten percent of the population; it is an elliptically-shaped mass about 2500 miles in length from east to west, and 2000 from north to south. “Australia is the world’s sixth largest country and its largest island. It is the only island that is also a continent, and is the only continent that is also a country. It was the first continent conquered from the sea, and the last. It is the only nation that began as a prison,” writes Bill Bryson in Down Under. The Boomerang Coast, the curved southeastern corner of the country, covers 5% of the land surface but contains 80 % of its population of about 23 million. It contains nearly all of its key cities, including Brisbane, Sydney, Melbourne, Canberra and Adelaide. 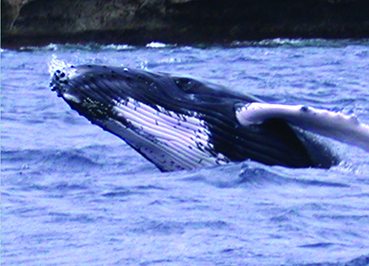 Australia is a land of extremes, from alpine snowfields to searing deserts and lush tropical rainforests. Of the continents, it is the lowest and flattest; it has the oldest soils and fossils. Only Antarctica experiences a lower rainfall. The largest living thing on earth—the Great Barrier Reef—grows in Australia. This country also contains what I believe to be the most remarkable monolith in the world: Ayers Rock (Uluru). Australia is quite dangerous to humans, no matter what their station in life. “What other country could just lose a prime minister?” Bryson asks. He reports that in 1967 the Prime Minister, Harold Holt, was just walking along a Victoria beach when he dashed into the surf and disappeared, never to be seen again. Australia has been called the home of the deadly. It hosts five of the world’s ten most poisonous snakes. The country’s saltwater crocodile has the most powerful bite of any species. The pain of its stinging stonefish alone can be lethal. The bites of the blue-ringed octopus can cause paralysis within minutes and lead to heart failure. The Sydney funnel web is one of the world’s most dangerous spiders. 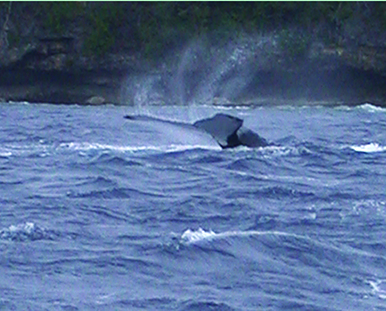 But the box jellyfish is rated the most dangerous threat to visitors, based on the likelihood of encountering one. Be careful! Pick up a cute cone shell on a Queensland beach, and you may be stung by the venomous snail inside. Step into the water and you could be chomped on by a shark. Go to a zoo, and you could get bit by a fierce and aggressive cassowary! The Australian outback is so large and remote that only a few lonely souls in the Great Victoria Desert of Western Australia witnessed an explosion that set seismograph needles twitching all over the Pacific region. Yet on May 28, 1993 the seismograph traces did not fit the profile for an earthquake and the blast was 170 times more powerful than any recorded mining explosion. There was no crater showing a meteor strike. The incident remained an unexplained curiosity until in 1995 Aum Shinrikyo gained sudden notoriety when it released huge quantities of the nerve gas sarin into the Tokyo underground, killing 12. Investigators found that Aum owned a 500,000-acre plot in Western Australia near the mystery event. There, they found evidence that the cult members had been mining uranium and had built a sophisticated laboratory staffed with two engineers from the former Soviet Union. The cult’s goal was the destruction of the world. The event in the desert may have been a dry run for blowing up Tokyo! Compounding all the mysteries of Australia are the enigmatic aborigines. When Cook arrived in Australia in 1770, he encountered a race that seemed unrelated to any of their neighbors in the region—the Polynesians, Melanesians, and Micronesians. Could they have invented and mastered ocean-going craft 30,000 years before anyone else, then abandoned all they learned to settle the interior and to forget about the sea? Pavlova from Heaven? No, Australia. One of the joys of sailing around the world was shopping at ethnic markets and trying out new recipes. During the time we spent in Australia, I was treated to this marvelous dessert twice. The first time I encountered it was in Bundaberg, Queensland—in a beauty shop, of all places! I was having my hair colored and cut, and while I was there, a lady came in cradling a box from the local bakery. “Pavlova!” my hairdresser shouted. Not having any idea what manna would taste like (I always thought it was a kind of bread), of course, I agreed to try it. The soft, sweet meringue melted in my mouth. The fruit provided a tangy contrast. Those tastes—combined with rich whipping cream—indeed tasted like a slice of heaven! 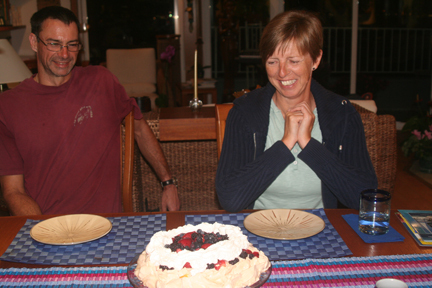 Pavlova is an authentic Australian specialty, so claim the Aussies. This dessert was created in honor of the famous Russian ballerina Anna Pavlova, after her tour in 1926 through Australia. But this dessert is also one of the national symbols of New Zealand. Anna toured both countries that year. So was this recipe was created in 1929 in New Zealand or in 1934 in Australia? The two countries have even taken the fight to court. 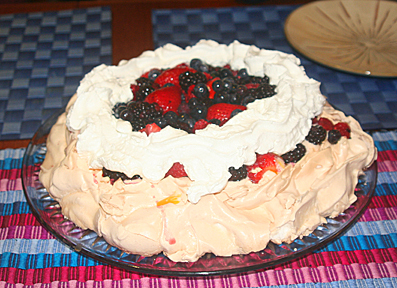 The controversy makes Pavlova all the more mouth-watering. I made the dessert for “the kids” last Sunday when they came to our house for dinner. My daughter-in-law, Sabine, guessed that it came from Austria. That’s where Google comes in! 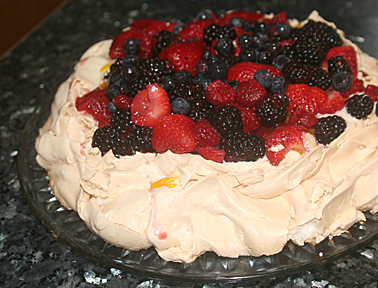 All agreed that my version of Pavlova (see below) was lip-smacking good. 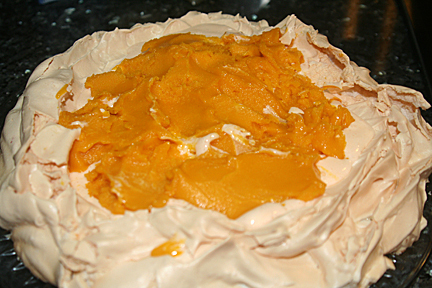 Place the Pavlova shell on a cake plate. Soften the ice cream and/or sorbet (if using). Spread first the ice cream and then the whipped cream over the shell and top with the berries. Slice into wedges or just heap into a bowl. 1. Preheat the oven to 375 degrees. Line a baking sheet with parchment and draw a heavy 10-inch circle on it. Turn paper over. 2. With the whisk attachment in place, beat egg whites, salt and cream of tartar in the bowl of an electric mixer set on medium-low speed. When frothy, increase the speed to medium-high and beat until the whites form soft peaks. 3. About 2 teaspoons at a time, add sugar while continuing to beat. Increase the speed to high and beat until stiff and glossy. Beat in vanilla, 1 teaspoon white vinegar, and 2 teaspoons cornstarch. 4. Spoon meringue into the traced circle, smooth with a spatula and shape like a shallow bowl. 5. To cook: Place in the middle of the oven and reduce heat to 250 degrees. Bake for 1¼ hours. Turn off the oven. Leave the meringue in the closed oven for at least 4 hours. 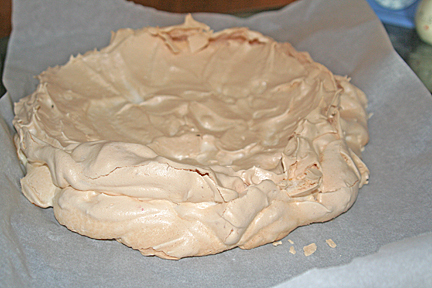 Leave the meringue in the turned-off oven to cool, preferably overnight. Should end up crispy on the outside, chewy in the middle. This may be Australia’s worst cyclone ever! Yasi has crossed the north Queensland coast and is starting to unleash the upper range of its violent 290km/h winds. Please pray for these Aussies, for their lives and safety. We love them dearly! I describe in my book “In Search of Adventure and Moments of Bliss: MAIDEN VOYAGE” how we were delayed in Puerto Vallarta by the first hurricane of the Central American season, Hurricane Adolf, in May of 2001. There, I learned from an expert sailor/weatherman how to track hurricanes on the internet. When it appeared that Adolf was turning out to sea, we decided to head out for the passage to Cabo across the Sea of Cortez, only to find out at the fuel dock that he had changed course yet again! We returned to port (one of the few times we did that during our entire eight-year circumnavigation) and took the Escape Adolf Tour to Tepic instead. Needless to say, I am now using my skills to track Hurricane Yasi, from the comfort of my San Diego home. (I’m also tracking yet another ferocious storm plying the U.S. Midwest). As I write this, the eye of the storm is approaching Dunk Island, where Pacific Bliss anchored before heading into Cairns the following morning.